In the second half of 2018, Hawthorn Brewing embarked on a major overhaul – completing a total rebrand, changing all of its core range recipes, adding a new beer and moving production in the space of just three months. In came a lighter new look and new, Aussie lifestyle-referencing names for the reworked beers as well as a focus on using almost entirely Australian ingredients. 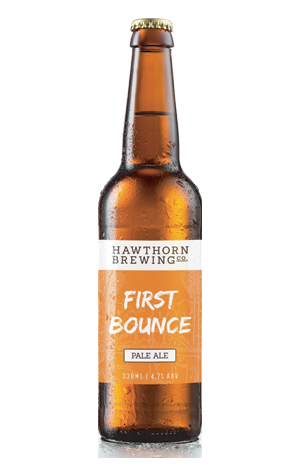 First Bounce moves Hawthorn's pale ale from the US closer to home, using Australian Cascade and Vic Secret hops atop of paler malt base than its predecessor. Thus, the classic US hop characters are replaced by something that sits in the ripe tropical camp – melon and stone fruit – with bite provided by a grippy resinous underbelly and a punchy bitterness.